Hi Fash-ology community! I'm so excited to write a feature for this amazing site and share my Fall Fashion Finds & Trends with all of you! A little about me, I'm a mom of 3 (humans) and 1 four legged golden doodle (trying to make it 2 but my husband isn’t really going for the 2nd puppy idea) from Dallas, Texas. I try to keep my fashion finds mom & LIFE friendly, easy, and comfortable. As women we are always running around, we are multi tasking machines, right? We all have days when we just don't want to put in the effort to get dressed, because our minds are so overwhelmed with everything we have going on we just “don’t want to think about it.” As a mom of 3, there have been plenty of days where I have left the house in my bun, sweatpants and POSSIBLY residual mascara from the day before (thats if I even put make up on.) I GET IT. I still have those days, I really do. It takes just as much time and energy to put on a pair of sweatpants as it does a pair of jeans. So I’m here to tell you, it’s okay to have that sweat pant, bun and residual make up day - and I’m also here to share with you some wardrobe staples that are cute, on trend, comfortable, EASY ways to feel put together, and budget friendly. Yes…..ALL OF THAT. 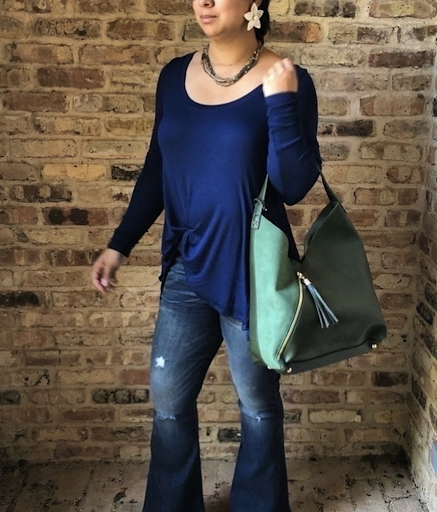 The first fall trend I’m excited about it the comeback of the flare leg/bell bottom jean! This cut INSTANTLY elongates your legs, this petite girl will take all the help I can get. 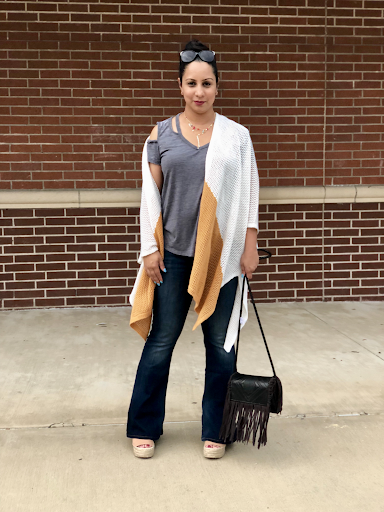 For all my fellow curvy girls out there - because the style of the jean is “curvy” to begin with, I personally feel this style of jean is the most flattering for us. For reference I’m under 5’2” I ordered these jeans in a “Short” and still need to wear heels. Both of these jeans are from the same retailer, the only difference between the two is the distressing on the pant leg and the hemline. If you want to wear these to work or be a little more “dressed up” - I would suggest no distressing. If you are anything like me, throwing on a simple tee shirt is an easy way to leave the house. This season I have been drawn to the “not so basic” basics. I love the t shirts or tops that have some added interest in them through asymmetrical hemlines, cut outs and if you follow me on Instagram you know that I CANT SAY NO to a knotted tee! I think these tops just added a little extra something to what would normally be a basic tee shirt and jean kind of look. The newest trend in layering - the bralette. It seems like this was just a natural progression in trends as unusual and asymmetrical necklines became more common, right? Usually we see bralettes being layered under tank tops with the option to put a cardigan over to make the look more seasonal - but the designer in me loved the idea of layering it under this “not so basic” basic. Layering with a bralette is also a great way to add a pop of color to an outfit. Take any top or sweater you may have that has an interesting neckline or is a traditional “of the shoulder, throw a bralette under it and it’s a completely different look! If there is anything you have noticed from my pictures, I hope it’s that the STATEMENT EARRING is where it’s at this season. A great pair of statement earrings can transform ANY outfit. You can use your earrings to set the tone for your entire look by adding a contrasting color, mixing metals or wearing a classic hoop. Many people associate this time of year with neutral and warm colors. While I agree, wearing neutrals is safe and sometimes the way an outfit comes together, I also want to let you know this is the year to wear leopard as a neutral! I’m showing this green dress as a example of a look that could have gone either way. It’s more classic with the neutral platform heels I’m wearing in the picture, but the look would instantly become more edgy (and comfortable) had I paired it with my leopard flats. I encourage you to mix leopard in with patterns and have some fun with it! Treat is like a solid, neutral color and your looks with immediately transform. Just NO. I know we were raised with this idea and habits are hard to break, but this one has GOT TO GO! If this rule was even a THING anymore…then why would my favorite shoe store be carrying this gorgeous WHITE fall bootie!?!?!? I see this and all the incredible white cardigans and jean and accessories out there as a sign. We can and should wear white after labor day. And if anyone tells you that you are breaking an age old rule of fashion, just remind them that Coco Chanel broke it too. These booties are perfect year round. Imagine them with a hot pink t shirt and jeans in the spring…..an off the shoulder sweatshirt and shirt for the fall and a pair of pleather leggings in the winter…..i could go on and on! Bottom line - WEAR WHITE!!!! Thank you again Fash-ology community for having me. I hope you found some inspiration in my words and looks!